The latest edition of the Les Méliés series of playing cards by Derek Mckee and Michael Blau pays tribute to the iconic film A Trip to The Moon directed by the French filmographer and magician George Méliés. This deck encapsulates many secrets and features, that will enable you to captivate your audience and push the boundaries of their imaginations. We encourage you to discover the special features on your own. The latest edition of the Les Méliés series of playing cards still features the timeless back design from previous editions. The faces of the Les Méliés - Eclipse Edition playing cards are standard faces. However, the standard bright red has been changed to a dark red to enhance the elegant look of the playing cards. 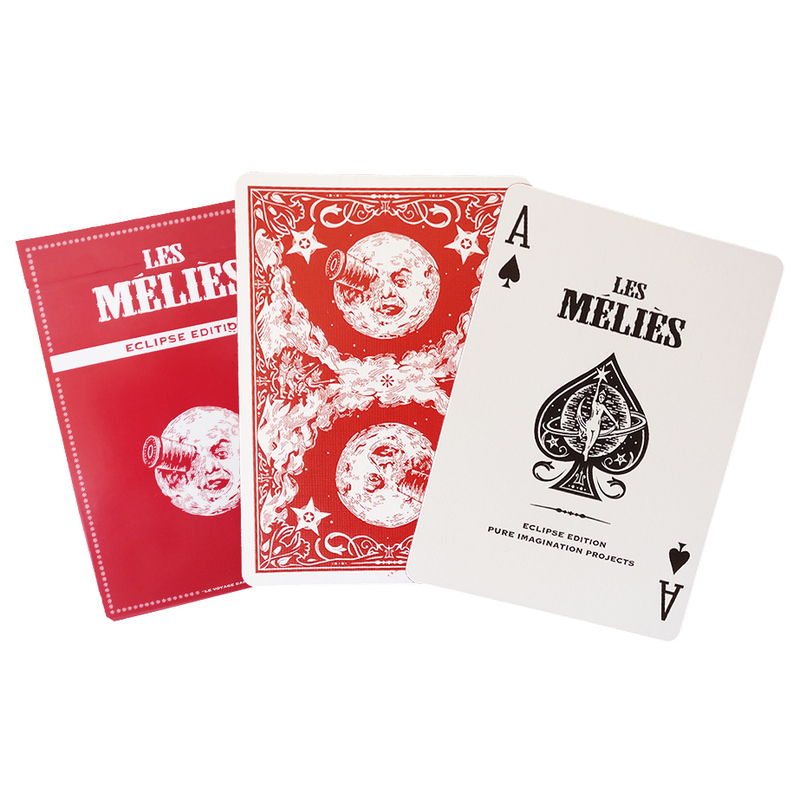 The Ace of Spades and the Jokers are the same as the previous editions of the Les Méliés series to maintain the tradition and tribute to the iconic film A Trip to The Moon. This latest edition includes an updated tuck box. The new design is simpler than previous versions, yet it continues to encapsulate the meaning and purpose behind the deck. The Les Méliés - Eclipse Edition cards were designed with the magician in mind. This deck is loaded with numerous features that will make them your “go to” deck for close-up, walkaround, and parlour performances. Some of the best features are: A clever and well hidden marking system. A subtle one-way back design. Two card revelations designed to fit in organically. The deck comes in reversed Mnemonica stack, right out of the box. And many more for you to discover on your own. Note: You will receive a free PDF revealing several of the hidden features and secrets in the new Les Méliés when you purchase the deck. Printed in Erlanger, Kentucky at The United States Playing Card Company. • The cards are poker size. Αυτό το προϊόν προστέθηκε στον κατάλογό μας την Friday 30 September, 2016.